Hello! Welcome to the blog, my name's Ailsa. I read a lot of different genres depending on my mood. My favourites are fantasy and urban fantasy but you'll also see reviews for crime, thrillers, contemporary romance and historical fiction here. You can follow the blog with GFC or by an email subscription, or follow me on Twitter - all links are over there on the right hand side of the screen. A little more about me: I graduated last year and currently live in Glasgow, Scotland. I've got a boring hospitality job while I'm applying for graduate jobs that I actually want to do! Feel free to leave your own website links in the comments and I will have a look at them. This week's question was to think of new things you'd like to know about the featured person, so I'm going to throw this question out to you, too: Why did you start blogging? Description: Awakening wounded in a darkened cell, their psychic abilities blocked, Aden and Zaira know they must escape. But when the lethal soldiers break free from their mysterious prison, they find themselves in a harsh, inhospitable landscape far from civilization. Their only hope for survival is to make it to the hidden home of a predatory changeling pack that doesn't welcome outsiders. 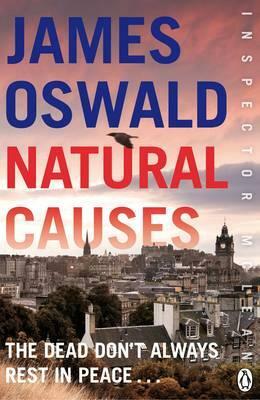 My thoughts: It's always hard for me to talk about a later book in a long series, which is partly why I've put off writing this review, and considered not talking about the book at all. 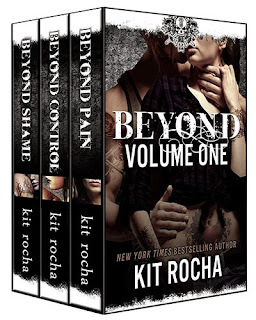 But it's still a great series and deserves some attention on the blog. 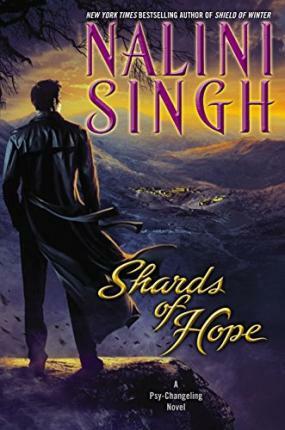 I really enjoyed Shards Of Hope, as I do with all of Nalini Singh's novels but to me it wasn't the most compelling romance of the series, not one I'll go back and read again and again. Aden and Zaira figure out pretty early on in the book that they like being together as a couple and that that is something they're going to make work with their lives. The romance is sweet and mostly easy and mostly takes a back seat to the politics. The psy/changeling world continues to change dramatically and Aden and the other Arrows are trying to help guide Psy with particularly strong volatile abilities to find a place in the new structure where they can be safe and more stable. 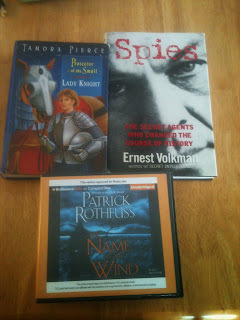 Things I particularly liked: Getting to know more about the Arrows and their inner workings; glimpses of a new Changeling pack (who I hope will get a lot more page time in the next arc of the series); a hero & heroine who are fairly equal in both their physical and mental abilities; brief interactions with some of my other favourite characters; the continued developments and backlash from events in the preceding couple of books; the set up of a new background conflict where the instigator is hard to pinpoint. I really enjoyed the book and of course I'm looking forward to the next one. 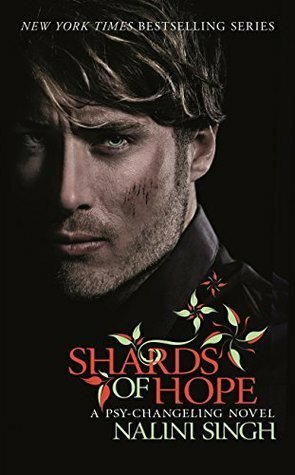 I'll give Shards Of Hope 8/10. Description: Sixteen-year-old Clariel is not adjusting well to her new life in the city of Belisaere, the capital of the Old Kingdom. She misses roaming freely within the forests of Estwael, and she feels trapped within the stone city walls. And in Belisaere she is forced to follow the plans, plots and demands of everyone, from her parents to her maid to the sinister Guildmaster Kilip. Clariel can see her freedom slipping away. It seems too that the city itself is descending into chaos, as the ancient rules binding Abhorsen, King and Clayr appear to be disintegrating. 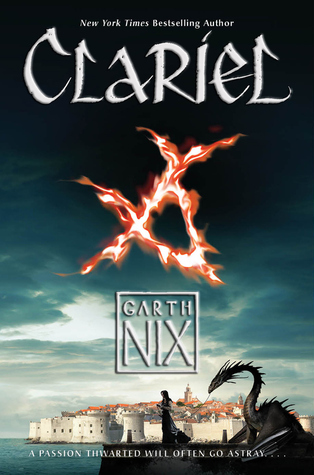 With the discovery of a dangerous Free Magic creature loose in the city, Clariel is given the chance both to prove her worth and make her escape. But events spin rapidly out of control. Clariel finds herself more trapped than ever, until help comes from an unlikely source. But the help comes at a terrible cost. Clariel must question the motivations and secret hearts of everyone around her - and it is herself she must question most of all. 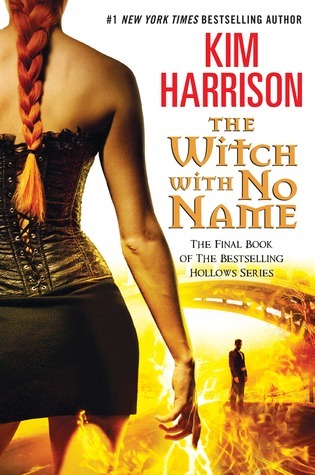 My thoughts: I’ll start by saying that this is a stand-alone novel set in the same world as Garth Nix’s ‘Old Kingdom’ series, however it’s set several hundred years before the previous books. So if you’re new to the world, you can start with this one. Having said that you can, though, I personally wouldn’t recommend it - there were several little details in this book that mean so much more when you’re familiar with the other books. I just feel like people will enjoy this book more if they’ve read the others in the series. It was so much fun to be back in the world of The Old Kingdom again! I really love the original trilogy and it’s one I re-read bits of almost every year. 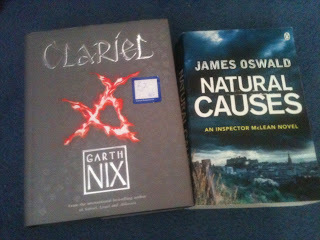 Clariel was fun to read but it wasn’t my favourite of Mr. Nix’s work. Something about the pacing of the novel just didn’t work for me and I wonder if the story was originally either longer or shorter and got changed to fit the stand-alone novel length that it is. This is another reason I don’t recommend it as a starting point. I don’t think this is the best representation of Garth Nix’s writing. One thing I did really like about it was that Clariel is asexual. I’m not sure if I’ve ever read a book with an asexual main character and that was interesting and refreshing. It wasn’t just done to make an ‘issue’ either which I appreciated; it’s a central part of who Clariel is (obviously) and ties in hugely to why she wants what she does and acts the way she does. 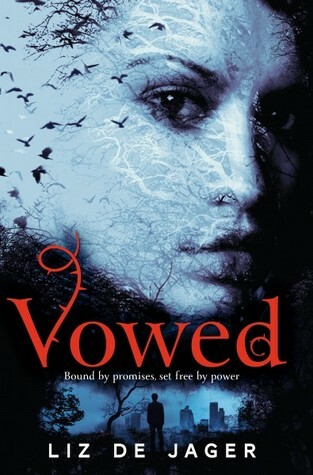 Yes, I liked this book, but it’s not my favourite in the series and while Clariel was a very interesting character to read about and see the little choices that lead her down her path, the plot and pacing just didn’t quite build enough intensity for me. My verdict on this one is 7/10. On a slightly-related note, I really want a ‘Does the walker choose the path, or the path the walker?’ t-shirt. Surely these exist somewhere? 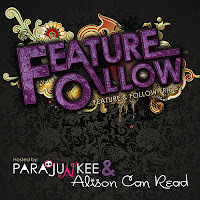 Feature & Follow is a weekly hop hosted by Parajunkee & Alison Can Read. You can add your link to the list on their pages. This week's question is: What book do you love that no one else seems to have heard of? I think in the book blogging world we get very into 'The Next Big Thing' and don't look back very often. So I have two slightly older series I want to mention today. Leave links to your own FF post in the comments and I'll have a look at them! 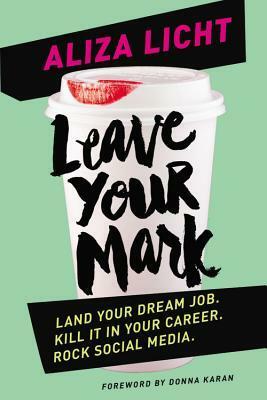 The tagline for this book (Someone's getting married. Someone's getting murdered.) intrigued me so I thought i would give it a go. In the very first pages, Nora, the main character, is running through the woods, trying to get to a road, and when she does, there’s some kind of accident - she wakes up in hospital. The book then alternates between the present with her in the hospital trying to piece together what happened, and her recollections. She was invited to a hen party weekend (or a bachelorette party in the States) for a girl she was best friends with in school. She hasn’t been in touch with the girl since Nora abruptly transferred school and moved away. She doesn’t disclose to the reader why but it was immediately clear that Something Had Happened. I made a guess straight away and when the ‘big reveal’ for that point eventually came along, I was right. It did frustrate me a little that it was built up as being a big deal and a big secret when I thought it was really obvious but maybe that’s just me and good guessing. Anyway, Nora goes to the party, where she meets other random people who have never met before despite all being really good friends with the bride-to-be, Claire. They stay in a big spooky house in the middle of some woods, and because in the hospital Claire knows someone has died, there’s immediately a sinister edge to things. One of the people here in the house is a killer, and one is going to be dead by the end of the weekend. I liked that over the course of the book, I suspected almost everyone of being the killer at one point. However it did narrow down to two in particular that I kept switching between. By the end, it wasn’t that surprising to learn who it was and I was skeptical that Nora hadn’t figured it out sooner. I did really enjoy this. It was a book I carried around with me, reading whenever I had a spare moment. It was easy to go in and out of that way and kept me up reading while I was in London. 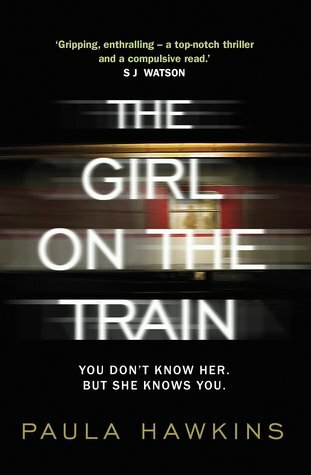 It was an enjoyable thriller to read, not too intense and creepy but still suspenseful with nuanced characters who had the potential to be both victims or killers. I’m giving this one 7/10. Description: With each passing day, Kelsea Glynn is growing into her new responsibilities as Queen of the Tearling. By stopping the shipments of slaves to the neighbouring kingdom of Mortmesne, she crossed the Red Queen, a brutal ruler whose power derives from dark magic, who is sending her fearsome army into the Tearling to take what is hers. And nothing can stop the invasion. My thoughts: I love this one! Great character development, realistic leadership and a fresh way of looking at 'world after the fall of technology/rise again of magic' idea made it one of my favourite reads of the year so far. In this book, Kelsea has settled in to the role of being queen but she still faces plenty of challenges. So often in fantasy novels, the prodigal young ruler takes the throne and immediately starts dispensing good advice and fair judgements, and is loved by all the kingdom. Kelsea is indeed gaining a reputation as a fair queen, but the decisions she makes and the way she handles things are often met with disappointment or alarm by her friends and advisors. She isn't the most tactful person sometimes. This book really looks at the price of doing what is right and the political ramifications for Kelsea and the Tearling because of what she has done and what she does in this book. People make mistakes and I think Erica Johansen tackles Kelsea's development very well. She's learning to do some things well, but there were points in the book where I was putting my head in my hand wishing she hadn't just said something. If this book held consequences from what happened in The Queen Of The Tearling, I expect book three will also show what has happened because of several small rulings taken in this one. In the first book, there were hints about the history of the Tearling and it's founding. People talk about 'The Crossing' from the old world and that many things were lost in that Crossing. In Invasion Of The Tearling, readers get to learn more about what happened. I knew as soon as I read it that some people were going to be... shall we say... upset, because of how it's done. 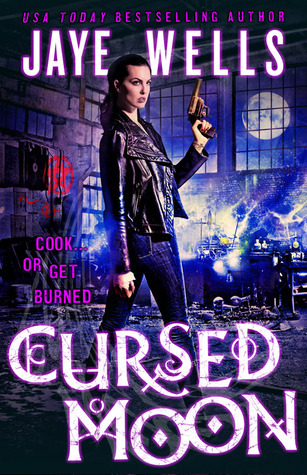 With her magic, Kelsea can see back in time into the mind of a Pre-Crossing woman called Lily. Lily lives in our world, in roughly the 2070s in the USA. So of course there is a lot of technology, cars, guns, security. (A lot of security - Lily's world and life are not pleasant ones.) It's a big juxtaposition between Kelsea's world with it's limited technology, building tools, and medical knowledge to Lily's world of modern conveniences and governmental invasions of privacy. I found it really interesting and I don't think it was a big deal, but I'm sure some readers will have issues about the contrast. I do have to say, that while it was really interesting to see the history of the Tearling and the reasons for it's foundation and some of why it is the way it is, with no technology, I'm not entirely sure why there was so much about it - I'm not sure about it's purpose in the story. My guess is that in book three, something that Kelsea has seen in the flashbacks will be very important and I'm looking forward to seeing things tie together a bit more. I loved getting to know some characters a bit better in this book. It really rounds out the world and shows the positive changes in the castle and the country since Kelsea has taken command. I'm really excited to see how characters like Glee and her sister who has joined the palace guard tie in with the bigger picture of the story. They, and other people you see more of in this book, like Pen and Mace, already have clear important roles in the story but I feel like they are going to have some staring moments in book three. 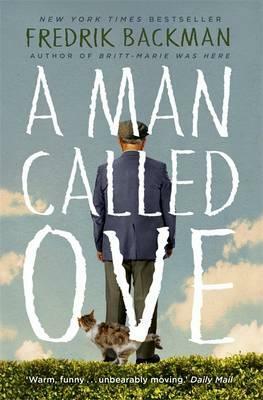 Overall, I absolutely loved this story. I read it over just a couple of days, I could barely put it down - I just had to know what happened next! Lily's story was just as gripping, and for me a lot scarier, than Kelsea's, and I enjoyed seeing Erika Johansen weave the two of them together. I adore the character development in this book, the changes in Kelsea were so well done and believable. She's growing up and adapting to leadership at a realistic pace, making the mistakes you would expect for a young woman and a new ruler. I really can't wait for book three. 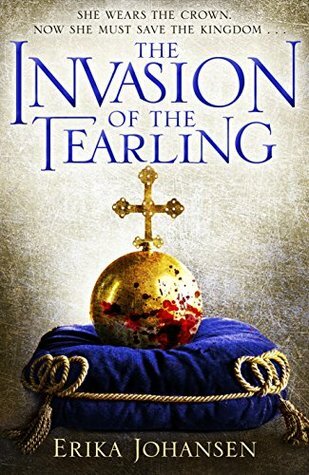 I'm giving The Invasion Of The Tearling 9 out of 10 stars. Let me know if you've read this one because I would love to talk about it with people! Good morning everyone! It's a lovely sunny day here in Glasgow, Scotland but unfortunately I'm going to spend most of it inside at work. Boooo. The new job has also meant a busy week, trying to get used to my new schedule and having full work days again, so unfortunately I didn't get any reviews up, but I've got a couple lined up for the next few days and several other exciting books to talk to you about soon. In the meantime, I said Friday was going to be Video Day. I know I'm a day late but here is a tour of my bookshelves here in Glasgow. There aren't many because I've just moved in and most of my books are still at home but there are some good ones and an exciting TBR pile here already. What are your weekend plans? Let me know in the comments! Most of these are published by PRH and were free copies but I also went to 'Fantasy In The Court' hosted by Goldsboro Books and Hodderscape, where I bought another book as well. I've listed them below the video if you prefer to read about them. Mountain Rescue - I love to ski and so do my family, so I thought this would be an interesting read to share with them. It's non fiction, about accidents in the mountains of New Zealand. Hiroshima - This was originally published in a New York paper shortly after the disaster & tells the stories of some survivors. It's very short and I've almost finished reading it. Highbridge, by Phil Redmond - This is a crime novel, set in Northern England, by someone who has done a lot of writing for TV in the UK. I don't know much about it but as this one doesn't come out until January, I'm not going to read it just yet. 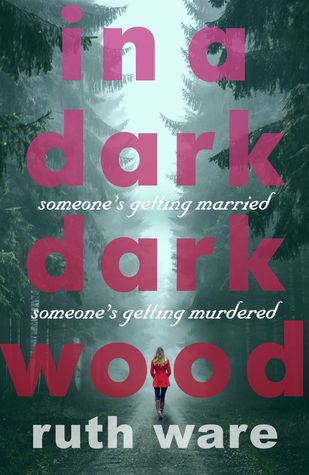 In A Dark Dark Wood, by Ruth Ware - This is a brand new thriller which I've finished reading already. I really enjoyed it, and just realised I haven't done a written review yet, but you can find my video review by clicking here. Watch The Lady, by Elizabeth Fremantle - Historical fiction, similar to Philippa Gregory. I haven't started it yet but I'm hoping to get to it later in September. tries to sort out some badly behaved fae in England. I'm reading it at the moment and will definitely be reviewing it when I'm done. So that's all of my books this week! 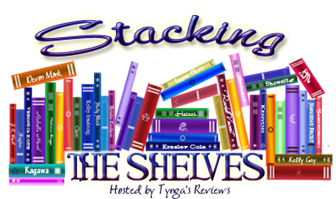 If you want to join the link up for Stacking The Shelves, you can do so on Tynga's blog. I read a lot of books and don't necessarily get around to reviewing all of them, or have enough to say about all of them to merit a review, so doing a reading wrap up at the end of the month to say a little bit about each is a great way to showcase them, I think. Since Friday is the day I usually participate in 'Feature & Follow', and that's not everyone's cup of tea to read about, I've decided that in addition to that, Friday is Video Day! Each Friday I'll be sharing a video from my Book Tube channel (which is Ailsa Vlogs, please subscribe!). Sorry for the radio silence recently - I had a family holiday, then went straight on to two weeks of work experience at Penguin Random House in London! That was an amazing time, but the wifi in my hostel wasn't the greatest, to say the least. I'm thinking about blogging about the work experience time, so let me know if that's something you'd be interested in hearing about. On to Top Ten Tuesday - I love this weeks topic! I think it's really interesting. A couple of authors popped into my head straight away but then I started remembering different (finished or ongoing) series I've read, which threw off my initial thoughts. For the purpose of the list, I'm leaving out short stories. I've put these roughly in order of number of books, counting down to the author I've read most. 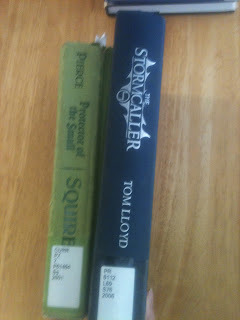 10) Tamora Pierce - Yes, these are quite short, but I've read two of her series now - 8 books total. 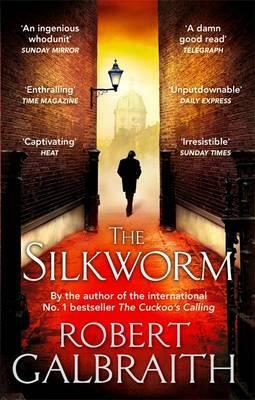 9) J. K. Rowling - Apart from Harry Potter, I've read The Silkworm, so that's 8 books. 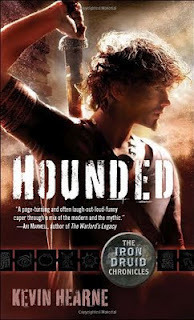 8) Ilona Andrews - I've read all except the most recent of her Kate Daniels books - 8 books again. 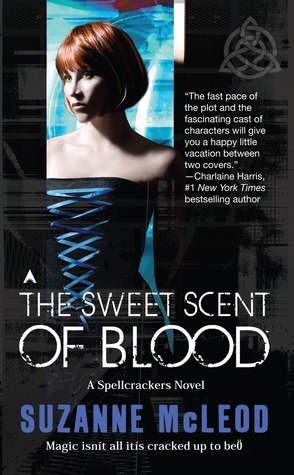 7) Richelle Mead - I've read several of hers from different series - 10 books in total. 6) Seanan McGuire - Despite feeling like I talk about her too much on this blog, I've 'only' read 11. 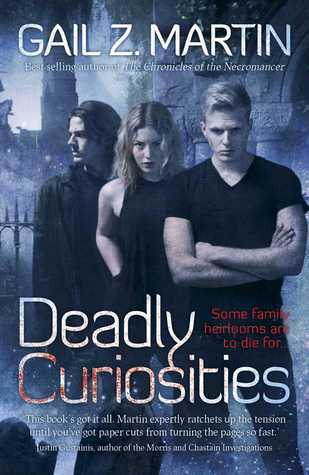 5) Katherine Kerr - She's started a new urban fantasy series (I've read the first one) but she's also got an epic fantasy sage, told over several quartets. I've read 13 of her books. 4) Kim Harrison - Every single one of her Rachel Morgan books. That's 13. 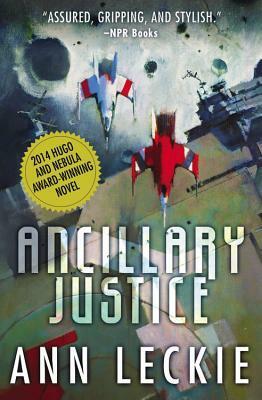 3) Keri Arthur - I've read a lot of these too, and still have a few Riley Jensen books to go. I've read 15 of her books in total I think. 2) Brian Jacques - In a throwback to childhood, I read a lot of Redwall books, plus some of his other work. I looked them up online and surprised myself - 17 books! 1) Nalini Singh - I've read all the Psy/Changeling books and several of the Angel series. 19 books overall. 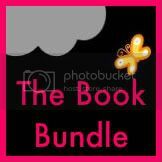 Top Ten Tuesday is hosted by The Broke And The Bookish - check out their page & the link up. Let me know if you've read any of these and what you thought of them! And if you leave a link to your own, I'll pop over and have a read. Description: Rachel catches the same commuter train every morning. She knows it will wait at the same signal each time, overlooking a row of back gardens. She’s even started to feel like she knows the people who live in one of the houses. ‘Jess and Jason’, she calls them. Their life – as she sees it – is perfect. If only Rachel could be that happy. My thoughts: I did not like this book. At all. I will go so far as to say I hated it. It's not the writing. It is a well written book. My complaint is with the characters. The book is narrated primarily by Rachel, who it quickly becomes clear is an unreliable narrator. Within the first few pages readers realise she's an alcoholic and as the story goes on there are other reveals here and there that show other things that have been omitted, which paint her in a more and more unflattering light. The other two women who narrate are Anna, who is married to Rachel's ex-husband and 'Jess' (actually Megan), the woman Rachel watches from the train. Primarily the narrators annoyed me for their idiocy. The three of them make silly choice after silly choice. In particular I had no sympathy for Rachel, who doesn't seem to be doing anything to help herself. I couldn't care about the characters or what happened to them because they were too idiotic. Rachel drinks and does silly things; Megan makes stupid choices and can't seem to grow up, and Anna sees everything as revolving around her. I forced myself to keep going and I'll admit that I didn't guess how the book was going to end but the characters drove me up the wall. They made it irredeemable in my opinion. I will give this 2/10, based on the fact the writing was actually fine.